John Carpenter’s The Thing  [Written by Bill Lancaster] is one of the most iconic science fiction/horror films of all time albeit a box office failure when it was released, the film has grown and developed a cult status. Ostensibly a remake of the classic  Howard Hawks-Christian Nyby film The Thing from Another World, Carpenter’s film is a more faithful adaptation of the novella Who Goes There? by John W. Campbell, Jr. which inspired the 1951 film. When rumors began spreading about a remake, there was an uproar which ultimately subsided when it was revealed the new film would be a prequel showing the events that preceded Carpenter’s original film. The Thing news has been quite scarce lately but today we’ve got official images from the film ahead of the first footage being shown at New York City Comic Con. UGO has released details of their set visit to director Matthijis van Heijningen's The Thing and HIT FIX scored some new images from the film. The 21st Century version of The Thing appears to share a lot with its 1980s counterpart. 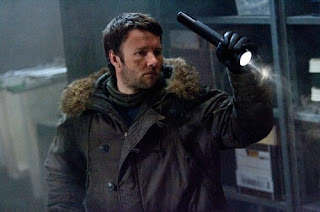 Star Joel Edgerton appears to be channeling original headliner Kurt Russell and the use of flamethrowers indicates that Van Heijningen is keeping a lot of the iconic elements from Carpenter’s film. In recent years, remakes of John Carpenter films have failed to match up to the originals – with The Fog, Assault on Precinct 13, and Halloween, failing to improve upon their “original” big brothers. 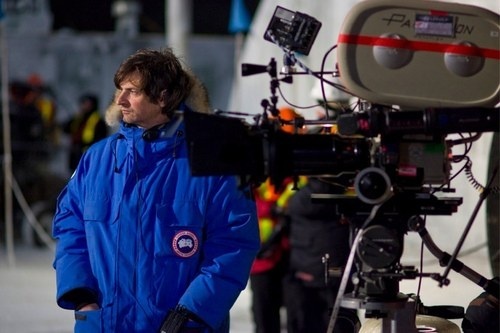 Director Van Heijningen will have to work hard to ensure that his film works within the context of the original film – while offering modern audiences a film experience to get excited about. 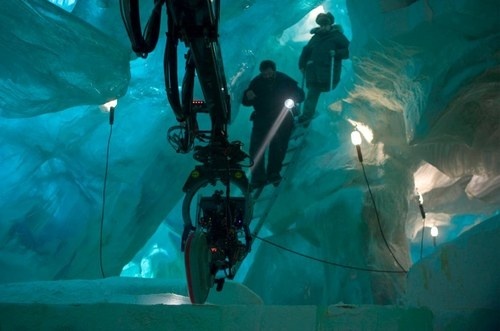 IO9 recently interviewed The Thing Prequel's [Producer] Marc Abraham, [Exec Producer] J. Miles Dale & [Effects Designer] Alec Gillis. Marc Abraham: "Carpenter's totally cool about this, John's signed off on all of this and we have the rights to another one of his Movies that we might remake." How much time was spent going over John Carpenter’s film? Marc Abraham: "Oh, forget it. Matthijs [van Heijningen Jr.] has on his laptop not only screen captures of that entire movie, but there isn’t a moment when he doesn’t go back to the original. A million of them. He’s so careful about where the axe is in the door or what the ice block looked like, or the spaceship, where they stand when we see the spaceship. Because we can do so much more, so many things we could do, but when it came to being anything that was referenced in that movie, we have absolutely stayed with it. Thousands of hours he’s spent looking at that movie. He knows and is respectful of every aspect." How much CG is the production planning on using to create the alien? The scariest part Carpenter’s work were the very real spider heads and flaying alien tentacles. Alec Gillis: "The interesting thing about this movie is that not only is there going to be real practical stuff that is completely animatronic and needs no digital embellishment, but there is also going to be a combination of the techniques. And the most interesting aspects of that, I think, are when you in a single frame and the two techniques working side-by-side....So it should be fun and chaotic, but still somehow rooted in reality. And I don’t mean to trash digital…I have my opinions about how it should be used and how it should not be used, but we have the guys that did District 9. So even I, as a snobby animatronics and makeup guy, I look at that work and I go, “that is frickin’ amazing work.” So I think we’re in very good hands on the digital end as well. Will this film respect the work that [special effects designer] Rob Bottin did in Carpenter’s original? Alec Gillis: "Yeah, it’s intimidating as hell...Because it was so… it was so… the term “groundbreaking” is always used. But it was so imaginative, beyond even what the technical aspects of it were, the materials used. The concepts were so very imaginative. So one of the things that that film kinda put into perspective [for] me is you can break ground technically or you can break ground conceptually. And I think that what we’re hoping to do is we’re hoping to take the updated technology, which is not code for digital, because I know there’s a lot of concern—I share that concern obviously, especially on this film, to not go too digital-heavy because that’s not the language of The Thing. But we’re hoping that conceptually, we’ve got something that fits within the lore of the film. It’s almost like if you look at the Howard Hawks version which had exclusively makeup, then you look at the Bottin version and it had makeup and animatronics, this one will have the cutting-edge animatronics and the little mini-revolution we’ve had since 1982 in the world of animatronics, plus it’s got the digital to embellish it. I don’t think you can really tell this story without digital because as great as animatronics can be, and as big a believer in them as I am, I think that you still need to open things up a bit with the digital, especially when it comes to transformations. And so once you have the best of both worlds, you’re free to let the audience enjoy the conceptuals." How much of the movie will be subtitled? "Since this picture is set on the Norwegian base, and the only characters we saw alive in Carpenter’s film [albeit very briefly] didn’t speak any English at all, we have to imagine that there’s going to be a lot of subtitling. Actress Winstead, who is seemingly stuck in a lot of those situations, confirmed our suspicions. Mary Elizabeth Winstead: A lot [of the film will be subtitled]. We did a lot of versions where we would do at the end, “OK now do an English version just in case.” I’m not sure exactly what they’re going to decide to do. But there’s definitely a lot of scenes with Norwegian. Which has been great, especially for my to not know what people are talking about. I don’t know if they’re talking about me, so you freak out a little... [English-language reshoots are] the same as [redoing] a scene without the f-word, just in case. It’s that sort of thing which is tacked in on the end, just in case someone has a problem with that scene being in Norwegian. But for the most part, I think it’s really cool. I think Matthijs [the director] really likes that there’s a lot of Norwegian in it. It has that feel about it I think that adds to the film feeling very European. Having a European director and a large European cast. It sort of has that feel about it. Which is very cool." Will Carpenter’s soundtrack be incorporated in some way? "The first few sounds you hear in the 1982 version are the skin crawling plunks from Ennio Morricone’s score. Apparently we should keep our ears perked for a few Morricone tributes, executive producer J. Miles Dale elaborates." J. Miles Dale: "I expect that there will be some echos of the Morricone themes. He’s pretty busy in Italy touring, so he probably won’t be doing the movie. But I expect that you will hear a familiar melody from time-to-time." Will the new soundtrack still have that stripped down, ominous feel to it? J. Miles Dale: "It’s not a comedy. It’s going to be kind of serious. It will be in that thriller or tense mode. Tonally it will resemble the original in the terms of that feel, but also, it’s a different movie. The things that tie this movie to the Carpenter movie are kind of obvious and we’ve done a lot of reverse engineering, in terms of the camp and the creature and when things happen and how things look. So there can be a continuum there. I think again that melody is a very signature melody, but we have a different director and this is a different movie so I think there will be some reinvention there, I’m sure." Will people be able to watch John Carpenter’s film and this prequel back-to-back? J. Miles Dale: "Obviously this film has to stand on its own. Nobody was really excited about a remake for obvious reasons, because of the comparisons and because you know what the story is. The notion of a prequel was very exciting to everyone, and we know that it will be held to that standard and that it is going to be a companion piece. So yes without a doubt. I think that there will be a huge demand to watch the other movie once people have seen this film. Matthijs has been very scrupulous about what we saw of the Norwegian camp in the first film, that’s what it looks like now. And the logic, when people should walk through, the alien in the ice block, even the guy who slit his throat, he’s a full-fledged character in this movie. We’ve really gone to great lengths to make that work... Without a doubt, it honors the details of the first movie." I'm reading: FIRST INSIDE LOOK INTO THE PREQUEL OF [THE THING]Tweet this!